“On Tuesday, in between independent study students had the opportunity to go on a tour of King’s college. Our student helper took students around the college, including into the beautiful and historic library, and the King’s fellows gardens. The tour was rounded off with a peek into the stunning early Renaissance chapel. In the evening our students got treated to a dinner at Cambridge institution The Smokeworks and rounded off the day with two fascinating ‘TED talk’ lectures. Wednesday morning was a time for quiet and private study during which the students were working on assignments for their supervisors. 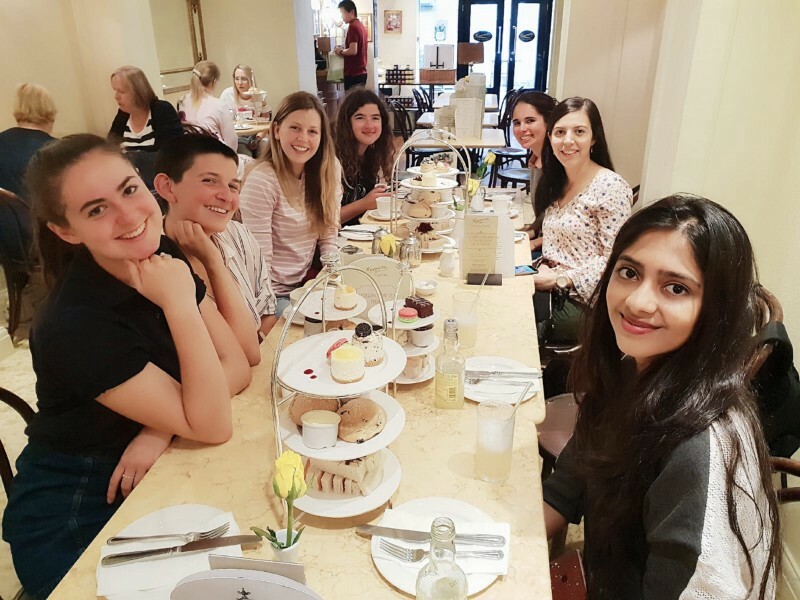 We then went out to Harriet’s tearoom for an amazing afternoon tea with several stacks of sandwiches, scones, cakes and macaroons! Some of the students then ventured to the museum of Zoology, a collection of weird and wonderful specimens! For the evening activities the students went to see the Merchant of Venice performed by the Cambridge Shakespeare company in the gardens of Downing College. Thursday marked the last of our student day trips with a tour of central London! We met at the crack of 7:50am to get on the coach (everyone was on time! Well done team!) which promptly set off for Westminster. When we arrived we walked to the glorious and regal spectacle of Buckingham Palace. After a walk down the mall we came to Trafalgar Square and were just in time to see the changing of the guard — an exciting an unexpected sight! Students were then given some time to explore London and the South Bank before getting the opportunity to explore the London Dungeons or the London Aquarium. Where students were enchanted by the beautiful sights of sea creatures and shocked by London’s gruesome past. The day was rounded off with a meal and Nando’s and a coach ride back with a beautiful view of the sunshine. Reach out to one of our Student Ambassadors to learn more about the on-course experience of our students!